As you all know, Valentine’s Day is fast approaching. Soon big amounts of cut-out Cupids, hearts, flowers and chocolates will fill every home, school and store. EcoPartytime loves Valentine’s Day and loves making it as green as possible. This day is all about love and we believe that means showing love to the earth as well as to each other. Around this time of year, there is always plethora of children’s parties to plan. 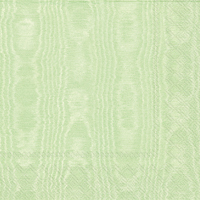 Why not take this opportunity to green your Happy Heart day? Whether you are a teacher, parent, or a group leader, here are 8 unique ways to green your Valentine’s Day kid parties that we think you will adore. 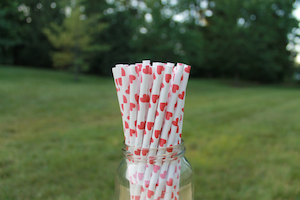 Throw out the plastic straws and cups and replace them with our compostable cups or small milk bottles accented by paper straws in pink, red and purple stripes or red hearts. As you know, plastic holiday decorations take forever to break down in landfills & paper holiday decorations are easily destroyed. 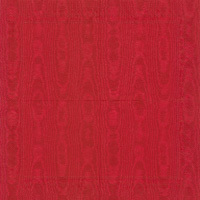 To avoid these issues, consider felt Valentine’s decorations for your party room. They are sturdy, reusable and so cute! Are you having cupcakes at your party? Jazz them up with these fun eco-chic cupcake wrappers. It’s a quick and easy way to add a pop of color to your treats table. Looking for an eco-friendly way to give Valentine’s Day cards without killing any trees? Use our 100% Tree-Free plantable valentines. They come in a variety of themes such as robot or fruits, flowers, honeybees and traditional hearts. Kids can plant the cards and watch as flowers start to bloom! To wrap your Valentine’s Day gifts, Ecopartytime has got you covered (pun intended). ;o) From our Sinamay Mesh and manila hemp twine to our valentine’s felt gift bags, your present will be wrapped in style. Make your Valentine’s Day Party a “Bee Mine” party. In the month of February, discuss the important role honeybees have on our Earth’s ecosystem. 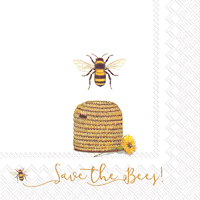 Hand out Bee Mine Valentines and one of our new beeswax travel tins to the students to illustrate how significant bees are to our plants and trees. They can plant their Valentine’s Day cards and watch as they grow flowers which will feed the bees and pollinate the flowers. 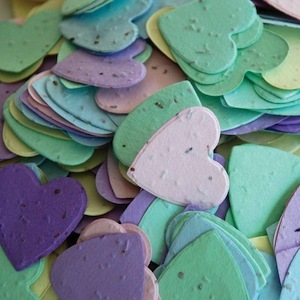 For an extra pop of color, consider scattering our Tree-free seeded heart confetti on your tables. It comes in nearly 20 colors including hot pink, purple and assorted pastels (like the conversation heart candies) When the party is over, have the children pick it up and plant it in their gardens or start a small class garden with the confetti. It’s a great way to teach about recycling, plant lifecycles and science in general. When the flowers grow, you can have the children identify the different varieties including Bird's Eye, Clarkia, Black Eyed Susan, Catchfly, Snap Dragon, English Daisy and Sweet Alyssum. Don’t forget your adult colleagues who helped you pull this brilliantly green party. For those amazing folks who have invested time, talent and goodies, consider one of our eco-friendly valentine’s inspired gifts like Big Dipper 100% Beeswax Aromatherapy Heart Tin or a Beeswax Heart Pillar with one of our sweet little heart bags. They will love them (and you)! 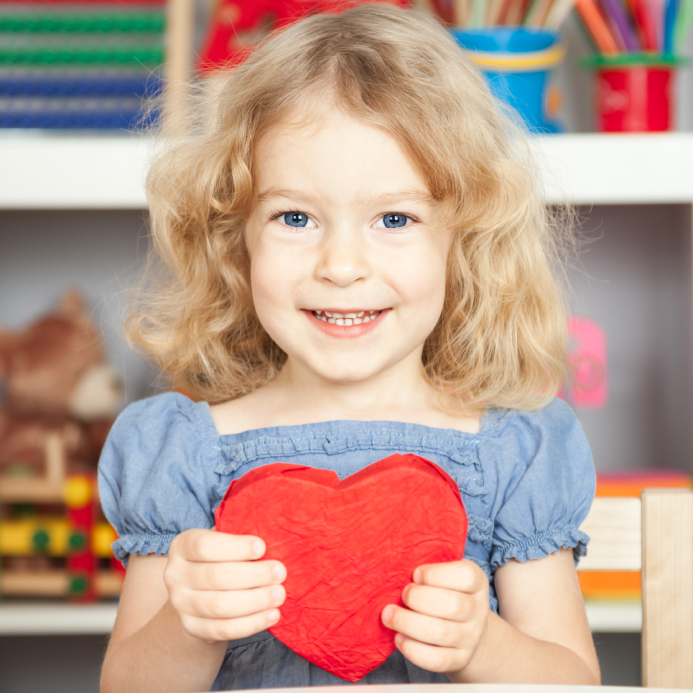 I hope these ten suggestions have given you some helpful tips & ideas to make your kid’s Valentine’s Day party meaningful, fun, and educational. 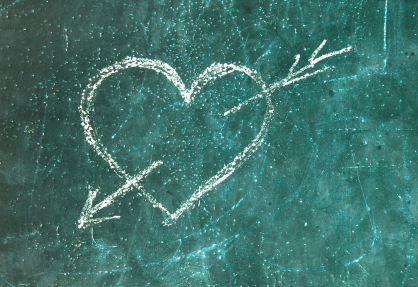 Make sure to send us photos of your Green Valentine’s Day celebration. We love to see how you’ve incorporated our eco-chic products into your green party!